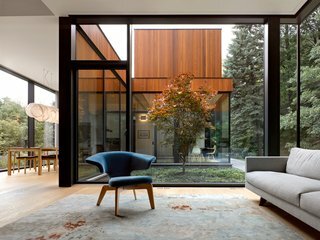 Toronto–based architects tackle the complex issue of aging in place by designing an accommodating multigenerational home. 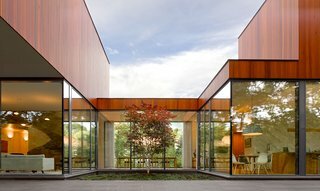 The House on Ancaster Creek is an award-winning project created by Williamson Williamson—the Toronto-based architecture and design studio—that presents a multigenerational living scenario for aging parents to reside with their adult children. 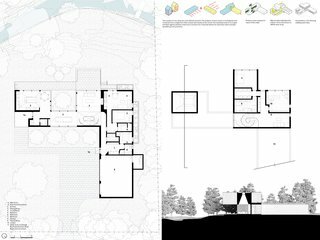 To allow each generation autonomy, the property has been conceived as two distinct residences—each forming a separate linear bar containing the full program of a home. The L-shaped dwelling creates a landscaped courtyard setback from the street, and runs parallel to Ancaster Creek, after which the home is named. An L-shaped configuration organizes the ground-floor spaces. The volume that accommodates the grandparents' suite contains a kitchenette, a bedroom, and a private bathroom. The parents' suite occupies the ground floor, with the living and dining space anchoring the view. A second bedroom and bathroom are adjacent yet separate, as they are meant to serve as a guest room or for live-in care to accommodate the family needs. The perpendicular volume faces toward the creek. On the ground level, the kitchen, living room, and dining area overlooks a courtyard that contains a small tree. The suite is laid out as a single-floor accessible apartment with added features to accommodate the specific challenges facing the aging parents. Among them are well-located drains and a master power switch that can be used to mitigate issues with memory loss—for example, if a sink is left running, or an oven left on. The kitchen anchors the south end of the home. 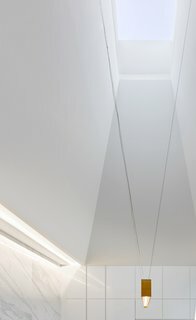 Set in a double-height volume, the 20-foot-tall pyramidal ceiling creates an expansive space that opens to the creek, the courtyard, and above to the sky. 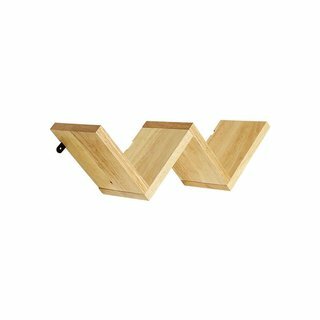 With its unique zigzag design, Crate & Barrel's Origami Wall Shelf will reshape the way you think about storage. Pinewood and iron construction makes it strong enough to hold and display favorite books and toys. Designed by Frama, the lamp is made of a simple sheet of metal, folded at a 90-degree angle. 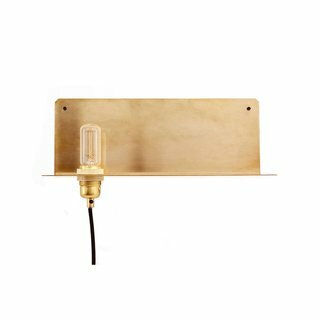 Just large enough to hold a glass of water and your wallet, this lamp is a perfect stand-in for a nightstand or console table in an entryway. 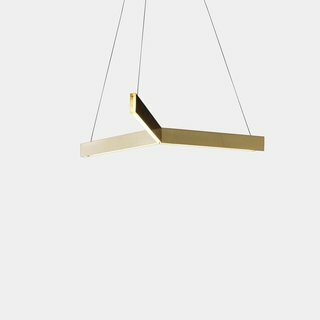 The Tri Pendant Light was designed by Scott Bridgens in 2012, and is made in New Zealand. The Tri Pendant Light is a highly modern light fixture highlighted by its classic geometric shape. A detail of the ceiling design. The small second floor acts as a private master suite. This space includes an office, as well as a light-filled cantilevered bedroom that houses the best views of the creek. 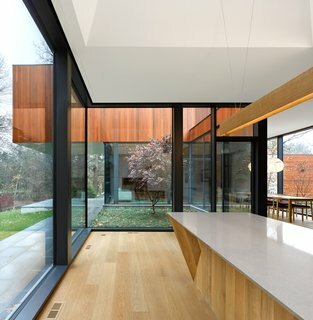 Angular geometry and a minimalist touch define the contemporary aesthetic of the residence. 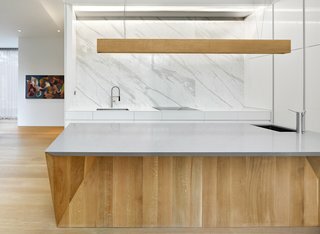 Calacatta marble slabs are meticulously detailed to reflect the surrounding landscape and contrast the heavy, flat-sawn solid oak island with a faceted base. Sustainability was also at the forefront of the design. To reduce the ecological footprint, energy consumption was decreased through a number of key moves. 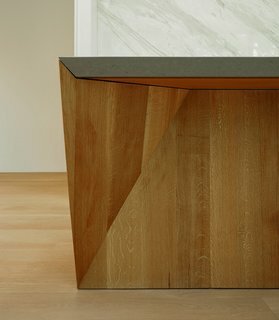 A detail of the counter design. 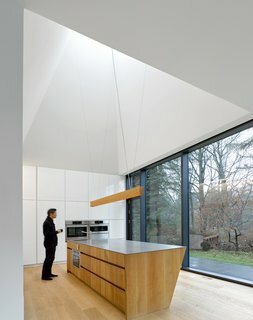 The dining room serves as the main shared social space between the two volumes. 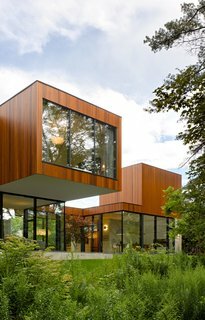 With glazed expanses on either side, the landscape flows from the creek, through the courtyard, and to the front of the house. The living room, which is just off the dining room, also overlooks the central courtyard. All of the social spaces are shared by the extended family. 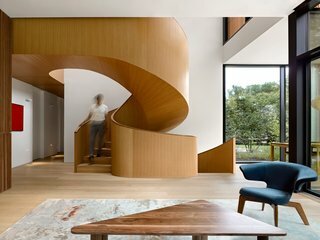 A wood-clad spiral staircase connects the living room to the second-floor master suite. 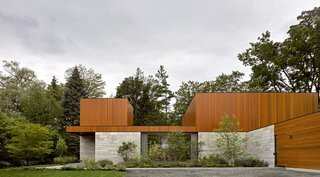 The exterior is a mix of wood and stone, and the ground floor is clad in locally-quarried Algonquin limestone around the perimeter. Architect of Record: Williamson Williamson Inc. Doors and Windows: Torp Inc.